Love is in the air and Cupid is making his rounds, which means Valentine’s Day is right around the corner. This holiday is known for romantic candle-lit dinners, sentimental gifts and of course, delicious chocolate. But why not go one step further and start the day off with a tasty breakfast? These Valentine’s Day-inspired breakfast treats will have you and your loved one feeling giddy all day! Have you ever heard the saying, “food is the way to someone’s heart?” Imagine waking up to the sound of bacon sizzling in the frying pan and the smell of fresh coffee. Do you feel warm all over just thinking about it? Give your loved one this fuzzy, warm feeling with these cute breakfast ideas. Add an extra touch of love by serving breakfast in bed! The smell of cinnamon drifting through the halls is a great smell to wake up to. Turn our Publix Cinnamon Rolls into perfect heart-shaped Valentine’s Day treats. For an extra touch, add a couple drops of red food coloring to the icing for a pretty pink topping! Remember Valentine’s Day is for everyone and kids love it just as much as we do! We’ve got some ideas that will be a huge hit with the kids. You’ll earn “cool” points with these emoji-inspired pancakes! 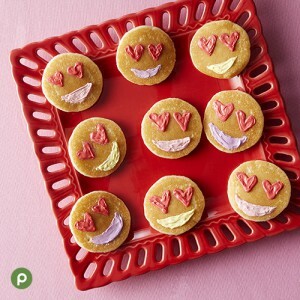 Just add heart-shaped fruit or sprinkles to the top of mini pancakes and use icing to draw a smile! Play a fun game of tic tac toe before heading off to work and school with this sweet breakfast idea! What better way to celebrate this day than enjoying your breakfast made with love. We hope these breakfast ideas help you surprise your loved one on Valentine’s Day! 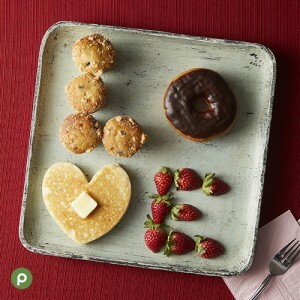 Do you have a special breakfast you surprise your significant other with on Valentine’s Day? Share a picture with us on Facebook, Twitter or Instagram! Alison, I LOVE these ideas and shared them on the Facebook page I manage for The Trails Shopping Center! We LOVE our Publix and the great team at our store! Thank you for sharing this blog and shopping with us!